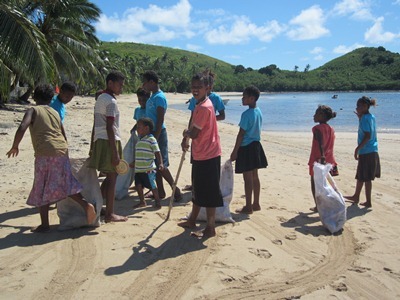 Previous work in the region has shown that the community of Kia Island, northern Fiji, is almost completely dependent on the marine resources of the Great Sea Reef for subsistence and their livelihoods. Over-exploitation and marine degradation is a problem throughout Fiji and Kians recognize that lack of awareness or understanding of marine conservation and ecology are the most prominent reasons for lack of compliance with fishing regulations. A biodiversity assessment of the Great Sea Reef conducted by WWF in 2004 indicated alpha diversity of high importance from local to global scale and recommended capacity strengthening and a programme of action for rare and endangered species found in the region. In response to these recommendations, this project aims to train members of the Kian community, with a particular focus on vulnerable groups such as women and youth, in marine conservation and social marketing, empowering the island’s community to make better informed decisions about their marine environment and to spread their knowledge and experiences among other communities dependent on the reef’s rich marine resources. Increased awareness of three redlisted flagship species (humphead wrasse, green turtle and spinner dolphin) will build on the community’s strong traditional and cultural ties to the sea.